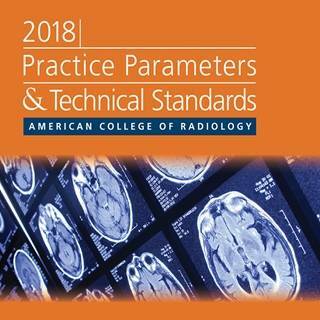 The American College of Radiology (ACR) has released four new and 23 revised documents in the 2018 Practice Parameters and Technical Standards. The four new practice parameters are the ACR–ASNR–SIR–SNIS Practice Parameter for the Performance of Endovascular Embolectomy and Revascularization in Acute Stroke, the ACR Practice Parameter for the Performance of Digital Breast Tomosynthesis (DBT), the ACR Practice Parameter for the Performance of Gallium-68 DOTATATE PET/CT Neuroendocrine Tumors, and the ACR–ACNM Practice Parameter for the Performance of 18F-Fluciclovine PET/CT for Recurrent Prostate Cancer. These guidance documents are available on acr.org and take effect Oct. 1, 2018. New, revised ACR practice parameters and technical standards cover 27 radiology topics. Appl Rad Oncol.